Hagstrom is possibly the only renowned guitar company to come out of Sweden. The manufacturer was started by Albin Hagstrom in the 1920s, importing German accordions, as electric guitars were not yet available. In 1932 they started making their own accordions. In 1958 the company made its first electrics. All of these were covered in sparkling celluloid, which was previously used in accordions. Most of the original models were fairly traditional in shape, using either an equal double-cutaway style or a rounded-off Les Paul shape. Most came with four single-coils in a position that made them look like humbuckers. 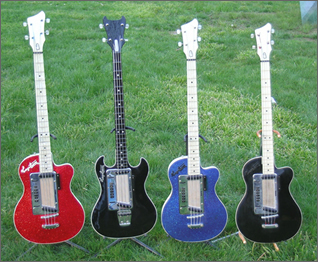 Some models also had a white pearl neck and a clear Perspex fingerboard. Hagstrom-built vibrato units were optional extras on most models. The guitars also usually came with a dizzying array of rollers and push-button selectors to split the pickups and change the sounds. The guitars were extravagant, and were not met with a great deal of success initially. Players preferred the simplicity of the relatively uncomplicated American instruments from Fender and Gibson, rather than the gaudy finishes and complicated controls offered by European brands like Hagstrom, Eko, Hofner and the huge assortment of fledgling Japanese makers. Hagstrom recognised this and introduced more traditional and better-looking guitars. These included the Swede, a Les Paul-shaped guitar, the Viking, a semi-acoustic which would be used by Frank Zappa and his son Dweezil, over 30 years later, and the SG-inspired I, II and III models, on sale now as the F-200. Sadly, this was not enough to save the company, and in the wake of increasing competition from the ever-growing Japanese makers, Hagstrom shut down in 1983. In 2004, however, the company was reopened by Tricor AB, who now distribute the guitars too. They are made in a dedicated Chinese factory and are sold for around Â£200-750 GBP. The reissues are based on the guitars made after Hagstrom stopped production of the lurid-finish 1958-early-1960s era, that is, mainly the Swede, F-200 and Viking, although with some new models introduced, and new versions of the classic designs. Original Hagstroms have a huge cult following due to their rarity and originality, to the point that there is a Hagstrom festival in Sweden for the first few days of every June. For their die-hard fans it is very good to see this old make back in action.